Wild — 110.0 miles; Total — 110.0 miles. From its headwaters in the Endicott Mountains and Walker Lake, the river courses south and west through a wide valley and passes through two scenic canyons. In the upper canyon, you'll encounter some Class 4 rapids that need to be portaged (about 1/3-mile portage), and there is one section of Class 2-3 rapids in the lower canyon. 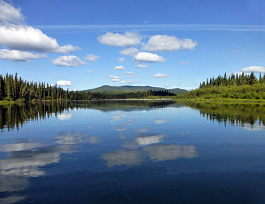 Kobuk means "big river" in the language of the Inuit. Native peoples have hunted, fished and lived along the Kobuk for at least 12,500 years, and the river has long been an important transportation route for inland peoples. In 1898 the river was the scene of the Kobuk River Stampede, a brief gold rush involving about 2,000 prospectors. Rumors of gold brought miners from along the West Coast by ship to reach the Kobuk and its tributaries. On arrival at the mouth of the Kobuk native people informed the miners it was a scam, and only about 800 miners ventured up the river. The result was that little or no gold was found and only on a few tributaries. The river supports an amazing, abundant fishery. The put-in for most river trips, Walker Lake, teems with grayling and trout. Anglers can count on catching 14-18" grayling throughout the river, and there is a sheefish (a whitefish) run in August with 36 to 40-inch fish.